An Intrusion Detection System (IDS) generally detects unwanted manipulations of computer systems, mainly through the Internet. The manipulations may take the form of attacks by crackers. Central Engine that records events logged by the sensors in a database and uses a system of rules to generate alerts from security events received. There are several ways to categorize IDS depending on the type and location of the sensors and the methodology used by the engine to generate alerts. In many simple IDS implementations all three components are combined in a single device or appliance. Intrusion Detection Systems (IDS) or Intrusion Prevention Systems (IPS) are used to detect & prevent attacks in real-time. However, if they are not configured properly they may be of no use. Further the events reported by these devices need to be monitored by analysts on a continuous basis. An important element of effective security monitoring is the ability to examine the packet decode from network intrusion detection systems. A skilled intrusion analyst will be able to analyze packets to reduce the likelihood of false positives and also be able to proactively update signatures and apply new filters to deal with the emerging threats. This workshop enables participants to gain a better understanding of about intrusion detection and traffic analysis. 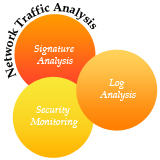 This workshop will significantly benefit professionals responsible for monitoring and analyzing network traffic to detect and prevent intrusions. The workshop is restricted to participants who have adequate knowledge of networking and TCP/IP concepts.